« There is only one morality…is it yours? As the Christian world begins the season of lent in preparation for Easter, there could be no greater surprise than the news that Pope Benedict XVI will step down from the Papacy on 28 February. Even though the reasons of deteriorating health are valid for an 85 year old pontiff, having not seen a Papal abdication since Pope Celestine V in 1296, (and even before then they were rare), the decision has met with expected shock. Pope Benedict is the 264th successor of the Apostle Peter in a line that has seen empires rise and fall and dynasties come and go. No institution is able to claim a more ancient status than the Catholic Church and the papacy. In modern times the Pope is referred to as the head of the Catholic Church, differentiating him from other Christian Churches and communities, but it is wise to recall that for the first thousand years of Christianity there was no other Church besides the Church led by the Pope. The schism of 1054 between the East (Orthodox) and the West (Catholic) was, and remains, a tragic political blunder which will certainly one day be rectified. The remainder of the Christian world goes by the name of ‘Protestant’ deriving most simply from a protest in the Middle Ages against the authority of the Pope. And so through the peaks and troughs of history, the Papacy has remained a constant. The scriptural home of the papacy has always been the words of Jesus to his apostle Peter, commissioning him to take charge of the keys to the kingdom of heaven. Peter was to act as the vicar of Jesus on earth and subsequent Popes have done the same. However as with most aspects of Catholicism, the role of the Pope is misunderstood, and we will see plenty of error trotted out as fact in the coming weeks. We will hear Pope Benedict being referred to as a conservative Pope who took a hard line on women priests and contraception, but the truth is every Pope has taken the exact same stance. While it is acknowledged that about eight Pope’s across the last 2000 years have lived morally or politically corrupt lives on a personal level, no Pope has ever, in his office as Pope, contradicted the teaching of the Christian faith. This is simply because the role of the Pope is less about making up rules than it is about preserving what is classically called the deposit of faith. Happily, the vast majority of Popes have been holy Christian men, but in one sense that has been a bonus. The role of the papacy exists to ensure that the official faith given by Jesus Christ is passed on, in its entirety, to every generation. So out of the one billion plus Catholics on earth no one has less room to move than the Pope. A Pope is not able to wake up one morning and decide to drop the 6th commandment or add a fourth person to the Trinity. The Pope can create laws for the Church in a particular time and place, such as the tradition of a celibate priesthood which could be changed by any subsequent Pope. The Pope cannot decide however to ordain women as priests, because most simply, Jesus did not do that and the Pope would be going beyond his mandate. Popes are not liberal and Popes are not conservative; Popes can only pass on what was given to them. The world witnessed Pope John Paul II struggle through Parkinson’s disease in his later years until his death in 2005. At that time there was calls for him to resign and while that was within his rights to do so, John Paul used his sufferings to demonstrate an inner strength that became more evident as his frailty increased. Pope Benedict in his notice of abdication, while acknowledging the value of suffering, feels he cannot adequately fulfill his enormous task as spiritual head of the Catholic Church. He will no doubt retire to the quite life of prayer, study and piano playing that he had hoped for prior to his election as Pope in 2005. 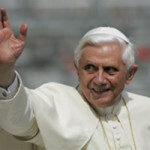 This decision of Pope Benedict need not be turned into more than what it is. If anything we see in this that the Catholic Church is always bigger than any Pope, priest or individual. For 2000 years the Church has been the people of God, following their Lord Jesus Christ, led by the successor of St Peter and nothing will change. 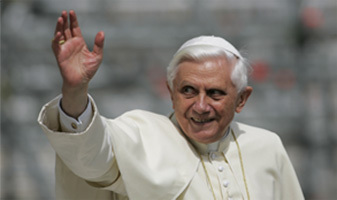 The Catholic faithful and all people of good will no doubt wish Pope Benedict peace and health as he takes a back seat for the election of a new shepherd.